Russian Helicopters Holding Company (part of Rostec State Corporation) is holding negotiations regarding delivery of up to eight rotorcraft units of three types to Malaysian customers. Contract details are to be specified during the fifteenth Langkawi International Maritime and Aerospace Exhibition 2019 through March 26 to 30 on Langkawi island. “Malaysian operators made requests for purchasing up to eight Ansat, Mi-8/17 and Ka-32A11BC helicopters. We are currently providing consultations to customers to clarify technical configurations of the helicopters planned for delivery as well as other organizational matters”, said Igor Chechikov, Deputy General Director for after-sales support and head of the delegation of Russian Helicopters Holding Company. The inquiries of Malaysian partners were partly a result of the South Asian Heli Tour organized by JSC “Russian Helicopters”. In November and December 2018 two new helicopters, one Mi-171А2 and one Ansat, made a tour over 5 thousand kilometers in length, holding demonstration shows in China, Vietnam, Cambodia, Thailand and Malaysia. “Southeast Asia is one of strategically important regions for us. We see numerous opportunities for increasing the export volume of civil rotorcraft”. After the recent South Asian Heli Tour we have concluded firm and soft contracts for the delivery of 70 civil helicopters. At present we are negotiating terms and delivery dates with the potential customers”, highlighted Viktor Kladov, Director for international cooperation and regional policy at Rostec State Corporation. Ansat is a light twin-engine utility helicopter serially produced at Kazan Helicopters. As per the type certificate, the helicopter design makes it possible to carry out quick conversion from cargo to passenger version capable to transport up to seven people. Ansat is certified for EMS version and for operation in ambient air temperatures from minus 45°С to plus 50°С. In addition, Ansat successfully completed a series of tests confirming its capability to operate in high-altitude conditions up to 3,500 m.
Мi-8/17 type helicopters and their various versions are among the most well-known and commercially popular rotorcraft in the world. The newest modifications are certified for operation in high-altitude conditions, adversary climates and a broad temperature range. Mi-17 helicopters are designed for a wide range of missions from patrolling, coastal guard services and EMS to search and rescue operations. Civil all-weather helicopter Ка-32А11ВС with coaxial rotor scheme was developed by Kamov design bureau (part of Russian Helicopters Holding Company). 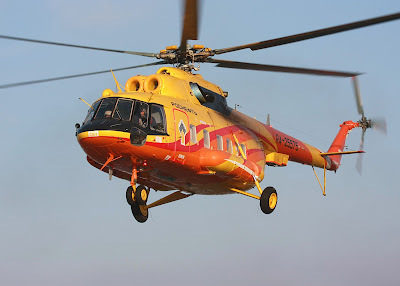 Serial production of Ka-32A11BC is carried out by JSC Kumertau Aviation Production Enterprise (KumAPE). Currently over 140 rotorcraft have been produced, operating in over 30 countries all over the world. The coaxial rotor scheme provides the helicopter with several critical stabilization and maneuverability improvements, especially for fire extinguishing missions. The configuration of Ka-32A11BC equipment features over 40 options.